security personnel and working professionals in the personal protection and security fields. measurable, controlled, dynamic and appropriate or morally justifiable us of force. which was until now available only to sworn peace officers and active military personnel working in a policing force or mission. as well as the most compassionate means available as directly proportional to the resistance and aggression encountered. DVD 1- Intercept: "Entering, closing the distance and acquiring position"
1.The Forklift. ISR LE's interviewing platform and neutral structure. 2.The Helmet. ISR LE's primary interceptor. 4.The Underhook & Pike. 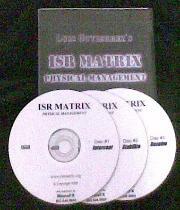 ISR LE's primary position in both the first two phases of the matrix. 6.Hand Fighting. 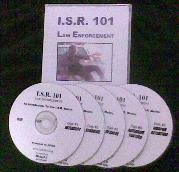 One of many ISR LE training method. 8.The Wrist Weave. ISR LE's unique entry from transporters and escorts. 10.Weak links in traditional tactics. DVD 2 - Stabilize: "Establishing control, destabilizing and grounding." 1.The Brace Position. ISR LE's primary position to neutralize striking. 2.The Harness. ISR LE's very secure body lock to either resolve the situation or wait for back up. 6.Shaking out the blanket. Brother tactic to the harness, an easy way to set the subject down. 7.Triple threat vs. the Underhook and Pike. Versatility, the true strength of the Underhook & Pike. 8.Quarter Position. ISR LE's primary and safe position for takedowns. 10.Wrist Weave. The wrist weave as a take down. DVD 3 - Resolve: "Establishing position, securing options and creating resolution." 1.The S-Position. ISR LE's safety position. The primary platform for resolution and cuffing. 2.Arm Wrapping. ISR LE's unique method to completely control and turn subject. 7.Rides not hooks. ISR LE's preferred platform from which to cuff. address and best represent and perform their job... to serve and protect. roots on through to the fine details of their expression. physically and why it is so quickly revolutionizing the way DT Instructors look at their own responsibilities, options and abilities. Black shirt with grey printed logos on chest and back. Hard wearing, heave weight and super smooth fabric for a great print result. Black cap with grey embroidered logo.